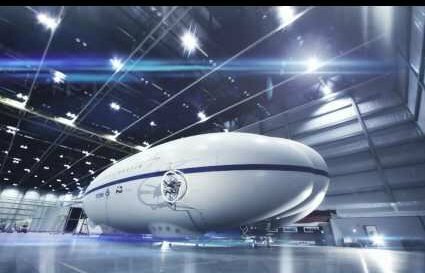 Lockheed Martin unveiled its new airship the P-791.The resurgence of airships is designed for both civilian and military use. The airships are relatively quiet and can stay in the air for up to 3 weeks!. With private industry making great strides to new methods of transport lets hope now that NASA can be inspired to work on its replacement for the now defunct shuttle. The American people dish out billions in taxes and this is what you build! This thing you call an airship is a joke! On top of that you use the analogy of a bullet to describe how sophisticated the defense system is. C'mon! You think we're so dumb that we'll believe that. Everyone knows a fighter jet could take this thing down in seconds. Am I going to be the only person who thinks this airship is ridiculous and a complete waist of time and money? modern looking design, the P-791airship,a BIG improvement compared to say the: "Hindenburg!!" I mean to be able to stay up there for "THREE weeks!?" Well,that's useful,isn't it? but don't go to sleep, or get caught in a storm up there, that could be nasty! A useful airship for varying tasks! Sorry people, I can't help myself. In my opinion this airship is so ridiculous I had to leave another comment. I'm sorry Randall, bud I think you are overlooking this airships usefulness, under the right conditions,given the correct circumstances! ?..THINK!..NO JOKE!! WHAT IF! !..one day, it where to save your life & others...NO JOKE!? they are supposed to be advancing technology and this flying buttock is all they come up with, it is ancient technology they are using now instead of advancing in this field they are going backwards. it looks like a flying arse imo.